Over the years, a designer develops a network of preferred suppliers: businesses and people who can be counted on to deliver the goods and services necessary to complete a project. Among these, there are often a few whom the designer establishes an especially close relationship with, whom she knows are guaranteed to elevate a project from great to extraordinary. Such is the case with Laura Agnew and Dario Drinovac. 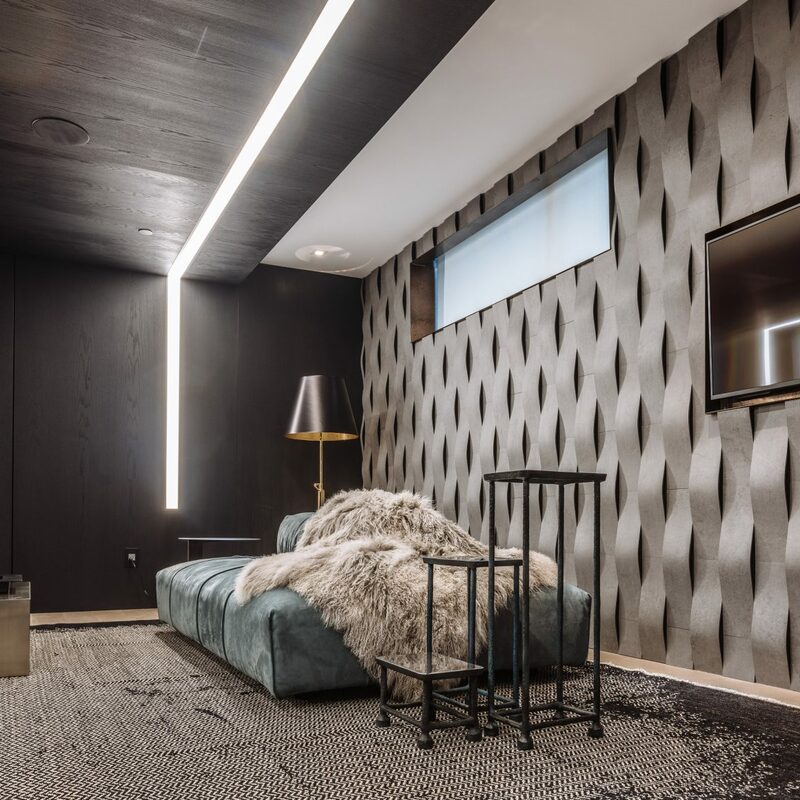 In the man cave, tiled walls give a three-dimensional effect. The rug is cleverly called Perfect Imperfection. (Opposite, bottom) Doors that fit flush within the wall, and are barely perceptible when closed, provide entrance to the media room. Tiles: Stone Tile; rug and sofa: Baxter Made In Italy; custom millwork: ROOM8. 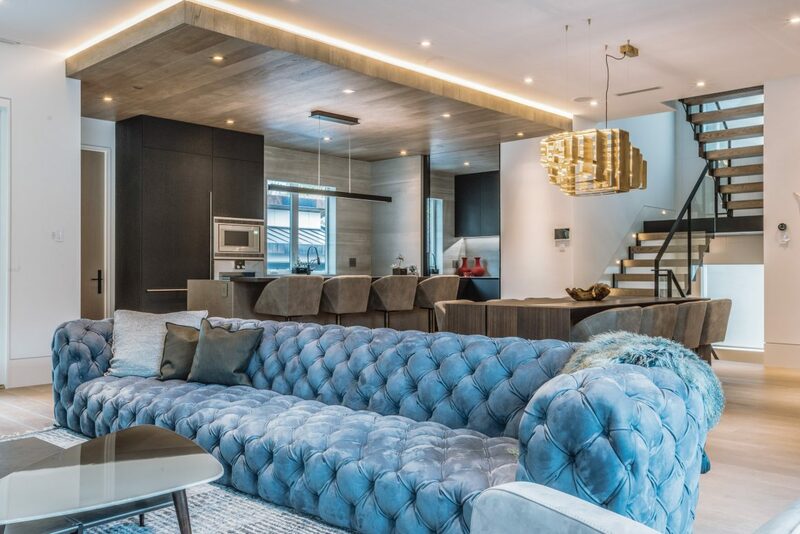 Agnew is the owner and principal designer of Laura Agnew Interior Design, and Drinovac is a designer and co-owner of ROOM8, a store that offers high-end home furnishings as well as design services. 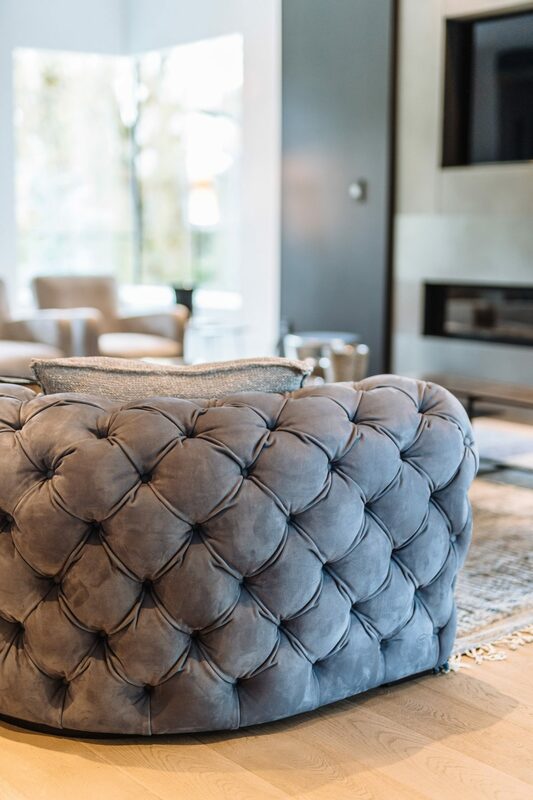 The metal coffee table and the two Paloma high-backed chairs with coordinating ottomans are among the few pieces that the owners brought from their former home. Chairs: Baxter Made In Italy. 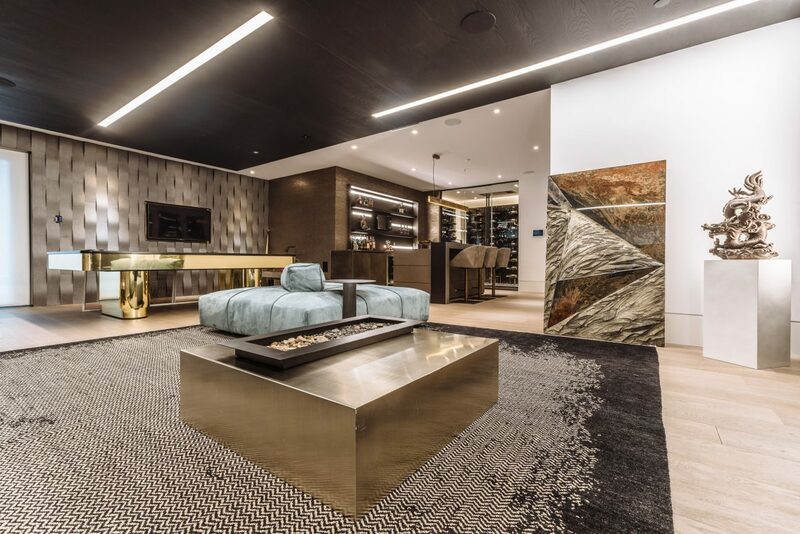 This 5,000-square-foot home’s interior is a prime example of the Agnew-Drinovac collaboration: sophisticated, daring, unusual. It’s the third home that Agnew has done for her client. He gave her pretty much carte blanche with the interior, knowing that she understood his taste. Shortly before the project took off, he got married, and thus the home’s design aesthetic reflects his wife also. 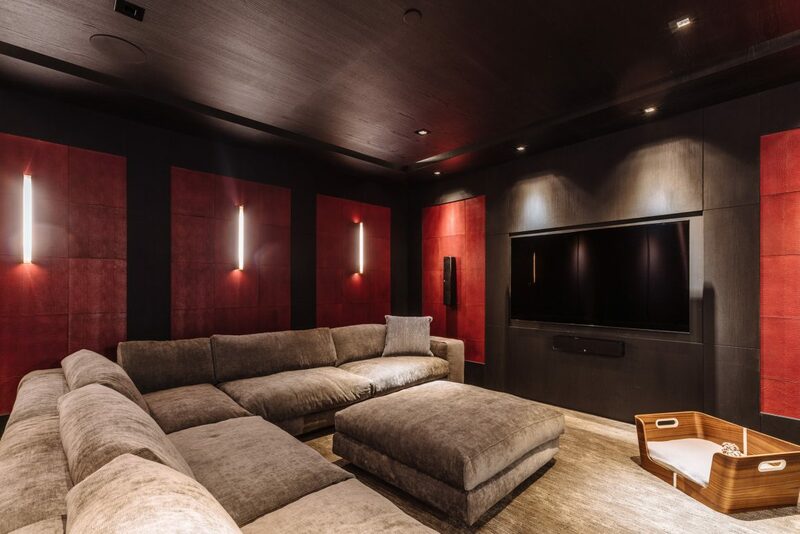 The homeowners had already purchased the red leather panels before hiring designer Laura Agnew. She chose to use them on the walls of the media room, to great effect. 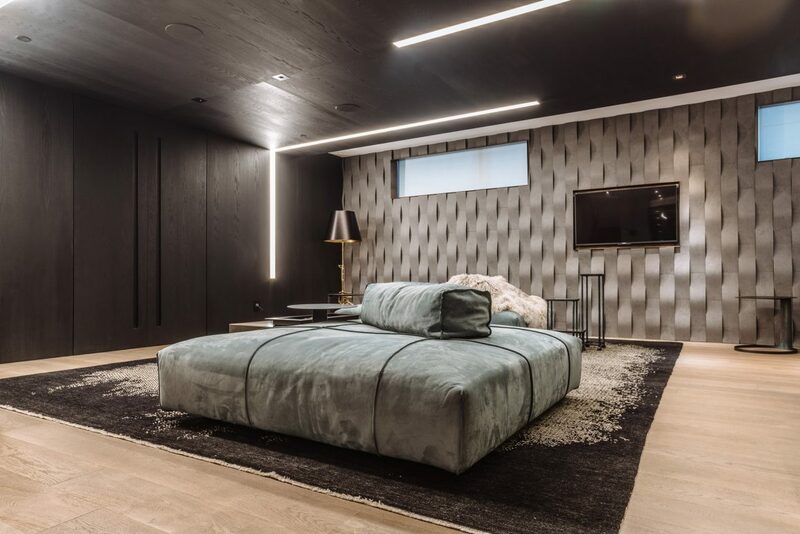 Sofa: Henge; wood panels on walls and ceiling: ROOM8 custom collection. Choosing ROOM8 for nearly all the home’s furnishings and millwork, as well as some panelled ceilings and walls, was an easy call for Agnew, who says, “Dario has the most cutting-edge products.” Drinovac ensures that ROOM8’s offerings are in the forefront of design that is the result of superb construction. 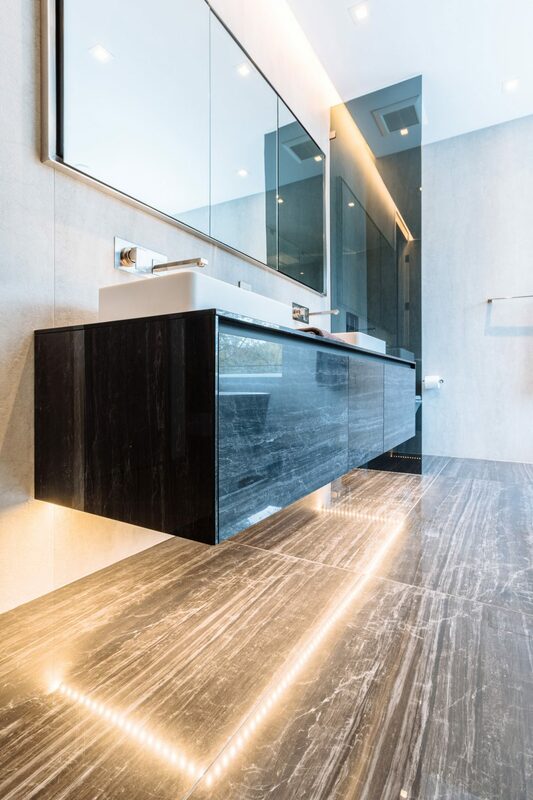 He relies on Italian design and workmanship to get the look and quality, supplying items from such companies as Modulnova and Baxter Made In Italy. 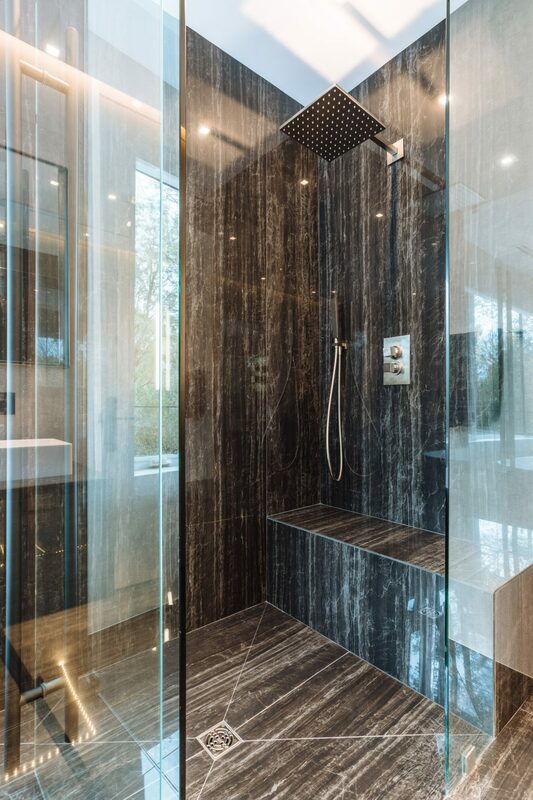 The master bathroom vanity, floor, and shower are clad in marble-look porcelain slabs. The master suite closet’s cantilevered shelves need no vertical supports, providing an uninterrupted run of hanging rails for clothes. Closet: ROOM8 custom collection. Another challenge for Agnew was dealing with interiors on which work had been started without her input. “I spent time trying to understand the space, what could and couldn’t change,” she says. 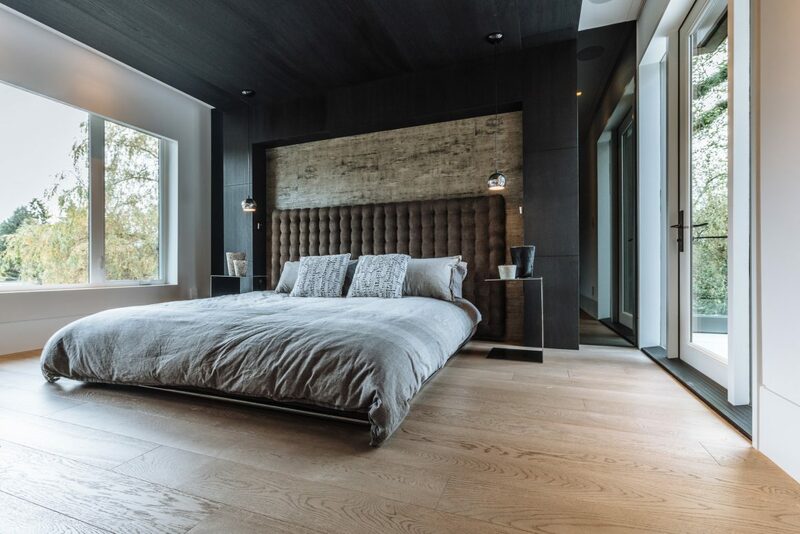 The master bedroom’s brushed-velvet headboard and textured-cork wall covering are framed by fumigated white oak, which turns near-black after the process. 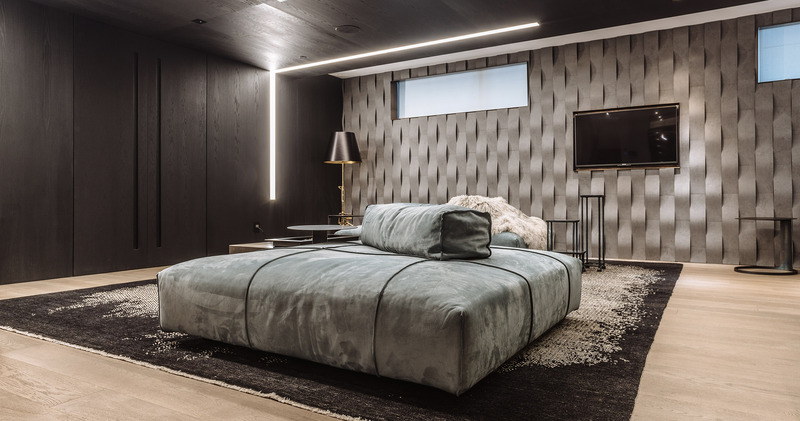 Bedframe, headboard and bedside tables: Twils; wallcovering: Élitis. 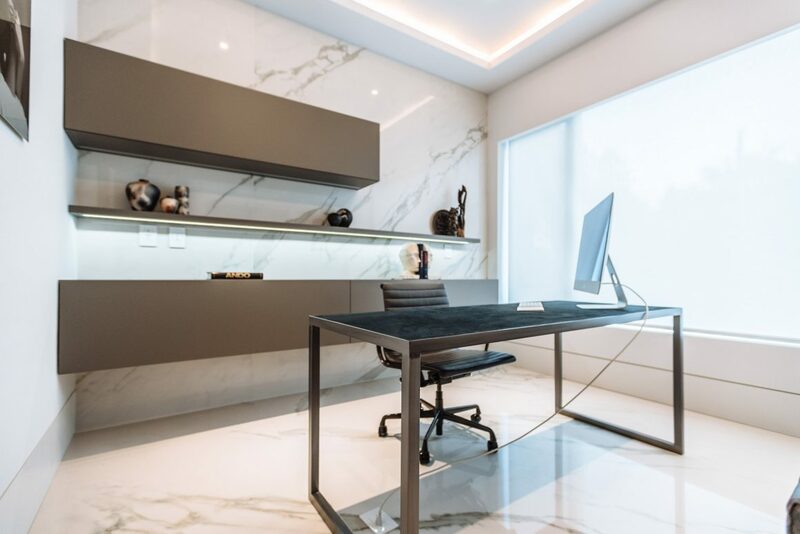 In the office, a brushed-leather inset in the desk provides a soft contrast to the porcelain-clad walls and floor, and the cabinetry from Modulnova’s Blade line in a satin lacquer finish. Cabinetry: Modulnova; desk: Baxter. ROOM8 was responsible for huge amounts of millwork throughout the house, in kitchens, great room, office, bedrooms, bathrooms, man cave, media room. Drinovac gives full credit to the installers – DB Custom Millwork Installations – for meeting exacting tolerances. 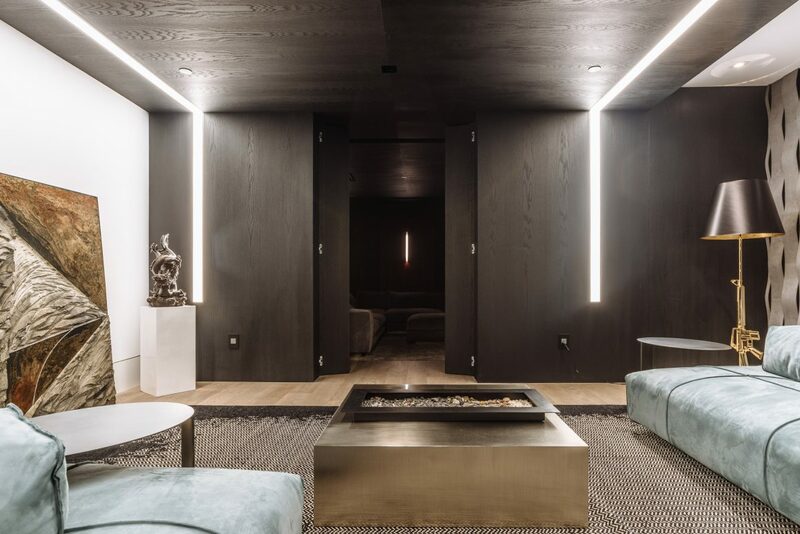 The television-fireplace unit in the living room is trimmed in titanium panels, flanked by fumigated white oak storage units. Millwork and cabinetry: Modulnova; installed by DB Custom Millwork Installations. There are several outstanding details among the cabinetry. 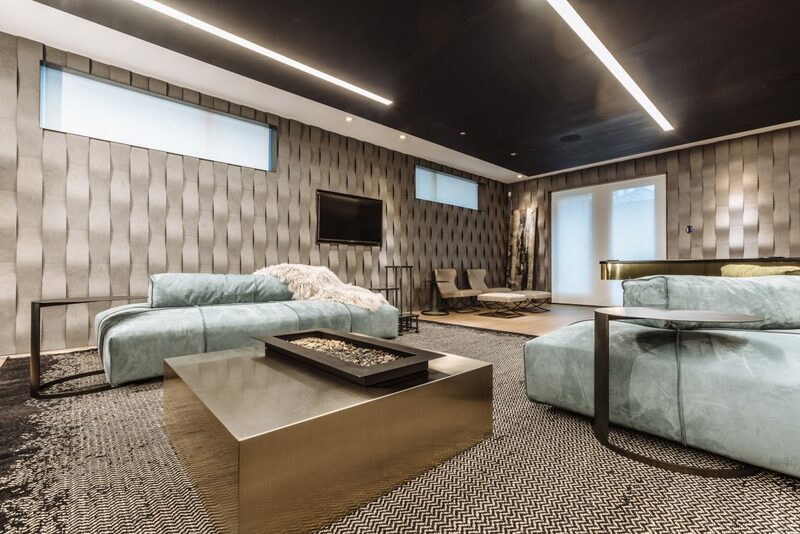 In the great room, for instance, the large unit encasing fireplace and television has titanium panels as accents. 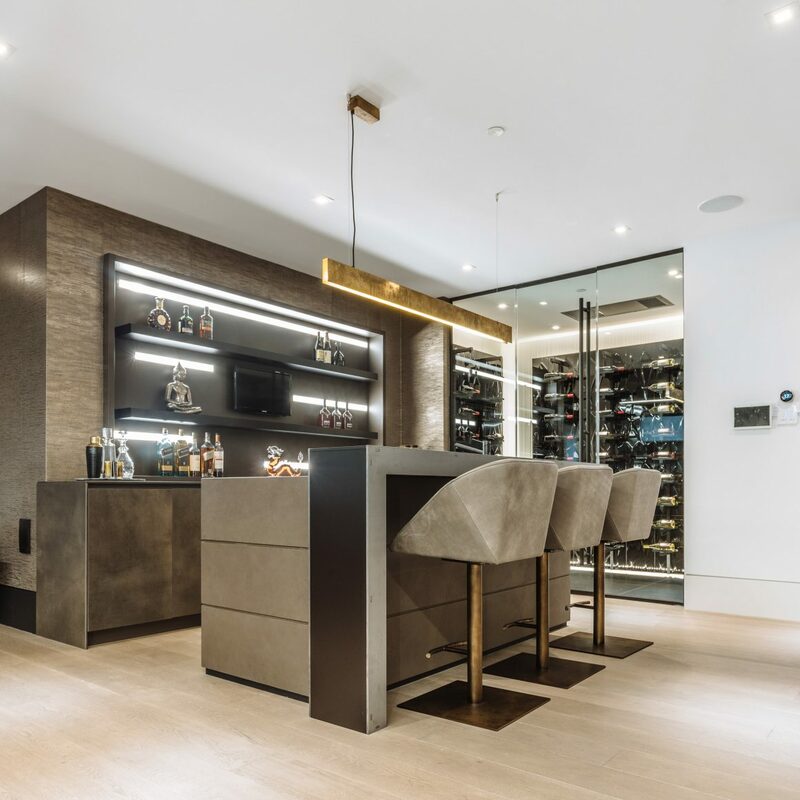 The kitchen cabinetry is from ROOM8’s Blade line, made by Modulnova and featuring, among other finishes, slim laminated porcelain surfaces for doors, drawers, and more. 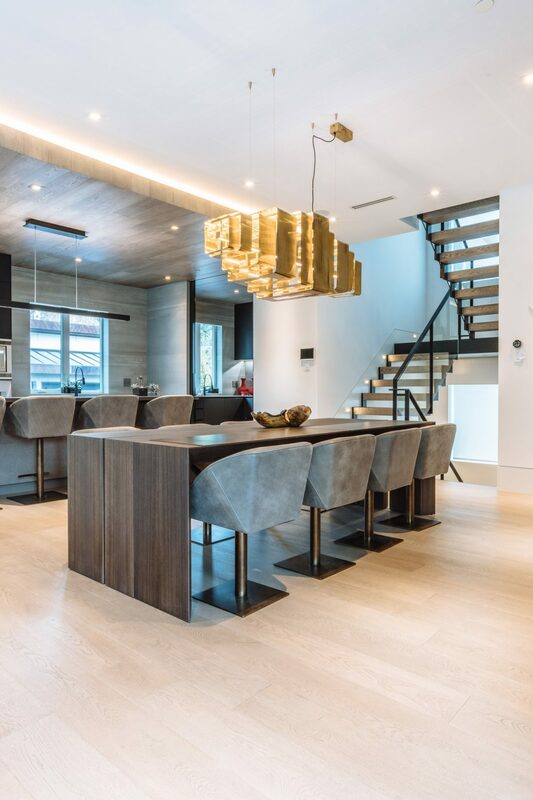 A spectacular brass chandelier illuminates the space over the eucalyptus wood dining table. Chandelier: Baxter Made In Italy; table, chairs: Henge. The island in the great room’s kitchen area is surfaced in durable porcelain from Modulnova’s Blade line. 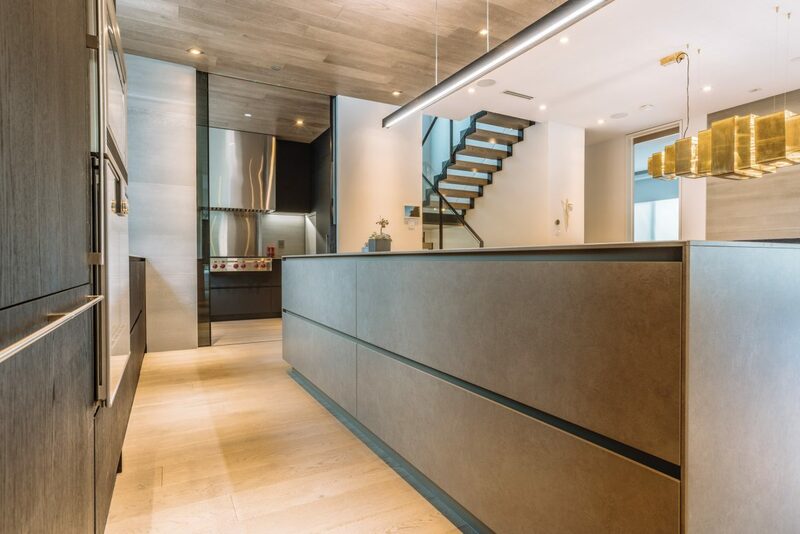 The wall cabinetry here and in the more secluded spice kitchen is also from the Blade line but is veneered in Phoenix aluminum laminate. Drinovac and team also supplied most of the freestanding furniture and elements such as lamps. Furniture, most by Baxter Made In Italy, has sumptuous finishes and upholstery. 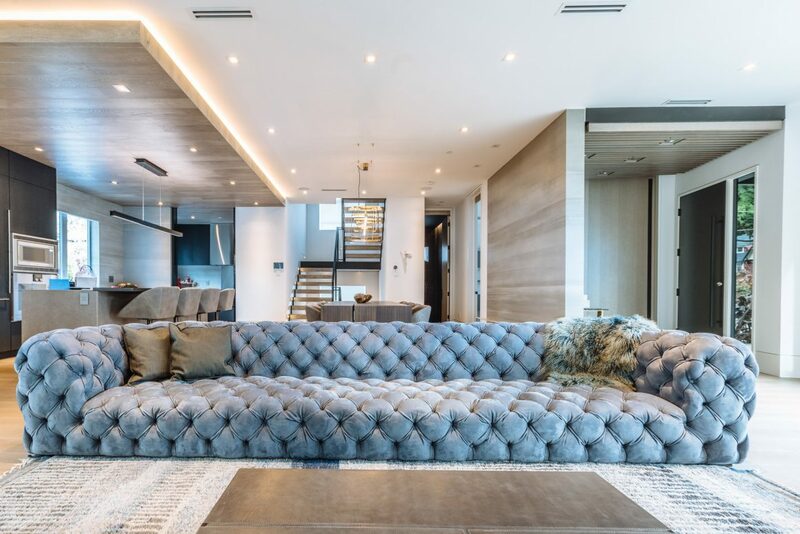 A case in point: the spectacular four-metre-long sofa in the great room, which is upholstered in “Kashmir leather” so fine that it looks like velvet. The massive sofa, in Baxter Made In Italy’s velvety-soft Kashmir leather, is four metres long. The white oak flooring is finished with a silvery patina. Flooring: Kentwood; Chester Moon sofa: Baxter Made in Italy.